While I was in Arizona for Ginger's Parrot Rescue Grand Opening Event, I had a chance to meet with Christine Wood who runs Christine's Chop Shop. Christine rescued an African Grey with major malnourishment problems and had to learn how to fix this bird's diet and nurse it back to health. As she started chopping away at loads of fresh vegetables, she learned that other people wanted some too and the Chop Shop was born. Among many nutritional recommendations, Christine suggests that, "some of the best veggies are dark leafy greens. Any of the greens: carrot tops, beet tops... chard, bok choy, any of the fancy lettuces, the dark leafy greens have the most nutrients. And it's best for the parrots. It's lower in calories and so you can feed them more if you give them the dark leafy greens." Some parrots tend to be deficient in calcium so Christine adds that, "you also need to feed, especially if you have an African Grey or a Cockatoo (one of the dusty birds), they need a diet that's higher in calcium. Broccoli is great, it's high in calcium. So is Kale, kale is one of top ingredients of what I feed my birds." Keep in mind that in order for the body to properly absorb calcium, Vitamin D is required. The most effective source of Vitamin D is natural outdoor sunlight so be sure to grab an Aviator Harness to get your parrot outside safely! Christine believes that variety is very important both nutritionally and to keep the parrots entertained. Christine notes that, "the large majority of parrots have Vitamin A deficiencies. They need produce that's high in Vitamin A. The dark winter squashes: butternut squash, acorn squash... those are really high in Vitamin A. Cantelopes if they want something a little sweeter and carrots." What do all those Vitamin A rich foods have in common? They're orange! If your bird is Vitamin A deficient, you can look into feeding more of those orange veggies or get Christine's Mega A Blend that already has just that. The way I understood it, the advantage of buying Christine's Chop Mix is that it comes with a massive assortment of veggies already in it. Even Christine agrees that feeding fresh is best. But there are plenty of reasons to buy the dehydrated of freeze dried chop mixes. Most notably is the included variety. If you only have one small parrot, buying some 25+ ingredients will get expensive and wasteful. Sure, if you have a huge flock to feed, you might go through it all. But on a small bird or small number of birds, it might be easier to get the benefit of the full variety by ordering your mix instead. Christine says "I cannot preach enough how important variety is." 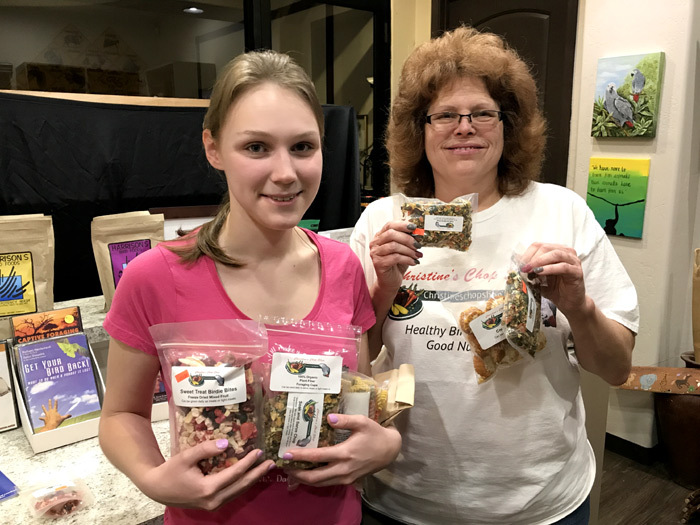 This is why her chop mix starts with a 15-20% base of barley, quinoa, cooked dried beans, chia and flax seed, no more than 10% fresh seasonal fruits, 70-75% fresh, seasonal vegetables. Ingredients may include; kale and other greens, cabbages, bok choy, carrots, corn, peas, string beans, zucchini and yellow squash, cooked sweet potatoes, beets, broccoli, cauliflower, bell and chili peppers, jicama, radish, snow peas, brussel sprouts, assorted apples, papaya, assorted, seasonal berries and other seasonal fruits and vegetables. Christine explains that the freeze drying process allows her to ship raw produce around the country while safely preserving it. She says that "when you freeze dry vegetables or produce your retain 97% of the nutrients and so that is considered raw." Watch the complete discussion with Christine Wood both about her business and lots of tips on fresh feeding for your parrot. And check out what Christine has to offer at ChristinesChopShop.com. Trained Parrot is a blog about how to train tricks to all parrots and parakeets. Read about how I teach tricks to Truman the Brown Necked Cape Parrot including flight recall, shake, wave, nod, turn around, fetch, wings, and play dead. Learn how you can train tricks to your Parrot, Parrotlet, Parakeet, Lovebird, Cockatiel, Conure, African Grey, Amazon, Cockatoo or Macaw. This blog is better than books or DVDs because the information is real, live, and completely free of charge. If you want to know how to teach your parrot tricks then you will enjoy this free parrot training tutorial. Trained Parrot site content Copyright 2010-2019 Michael Sazhin. Reproduction of text, images, or videos without prior permission prohibited. All rights reserved.